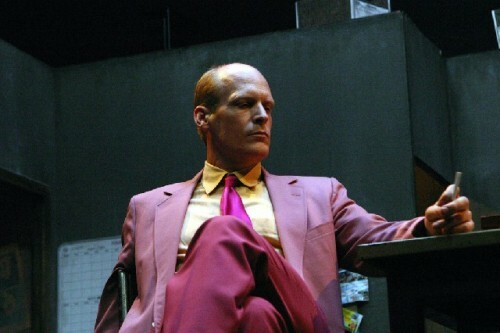 Man in a pink suit. Photos courtesy of A.R.T. The eerie set of Gatz. WHAT: The American Repertory Theater (A.R.T.) presents Gatz, the critically acclaimed international touring production by Elevator Repair Service directed by ERS founder and artistic director John Collins. A theatrical tour-de-force, Gatz is conceived as a single six-hour production in which the ensemble brings to life every word of the novel with no text added and none removed. Gatz is a one-of-a-kind theatrical event defined by its radical commitment to one of the 20th Century's greatest novels. TICKETS: $25 - $75. Student rush $20. Seniors $10 off ticket price. www.AmericanRepertoryTheater.org, or in person at the A.R.T. box office. The performance schedule for Gatz has been structured to enable audiences to view the entire production in one day (Saturdays, Sundays, Monday 1/18, Fridays 1/15, 1/29, and 2/5). These performances include two intermissions and an hour-long dinner break, for a total running time of approximately seven and a half hours. Audiences attending weekday evening performances will be able view the first half (Chapters 1-5 of the novel) and the second half (Chapters 6-9) in succession on different days. A complete performance schedule follows below. Originally created by ERS in late 2004, Gatz has subsequently toured to nine countries on four continents, playing the Sydney Opera House, the Holland Festival, the Vienna Festival, the Dublin Theatre Festival, the Chicago Museum of Contemporary Art, Minneapolis' Walker Art Center, and the Philadelphia Live Arts Festival, among others. Gatz stars Wooster Group veteran Scott Shepherd and features New York City Players' Jim Fletcher in the title role. Jim Fletcher in the title role (Forced Entertainment and NYC Players), and Gary Wilmes as Tom (Obie winner, Adam Rapp's Red Light Winter at Steppenwolf and the Barrow Street Theater; films include A Mighty Heart, I Hate Valentines Day, Salt.) It also includes Susie Sokol (Jordan), Sibyl Kempson (Jordan), Laurena Allan (Myrtle), Aaron Landsman (Wilson), Frank Boyd (Wilson), Annie McNamara (Catherine), Kristen Sieh (Catherine), Kate Scelsa (Lucille), Vin Knight (Chester), Mike Iveson (Klipspringer), Ben Williams (Michaelis), and Ross Fletcher (Henry C. Gatz). The creative team is led by ERS' longtime director and founder John Collins. Also contributing is associate director Steve Bodow, ERS' former co-director, a founding member of the company, and now the head writer for The Daily Show with Jon Stewart (six Emmy awards and a Peabody Award.) Obie Award-winner Louisa Thompson (Blasted at Soho Rep) designs the set. Mark Barton, a Lortel Award nominee whose numerous off-Broadway credits include Circle Mirror Transformation, The Shipment, Chair, No ChildÂ… and Thom Pain (based on nothing) designs the lighting. Colleen Werthmann (13P's American Treasure, Beast at New York Theatre Workshop) designs costumes. John Collins (director) founded Elevator Repair Service (ERS) in 1991 with his first production, Mr. Antipyrine, Fire Extinguisher. In the 18 years since, he has directed or co-directed all of the company's shows. From 1993 to 2006 he worked for The Wooster Group as a sound designer (two Drama Desk nominations and two Bessie Awards). 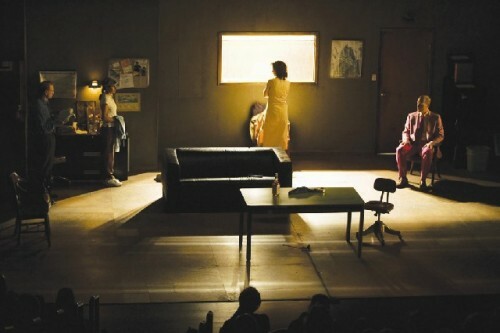 As a lighting designer, he won a Bessie Award for his design of ERS' Room Tone. John was born in North Carolina and raised in Vidalia, Georgia. He holds a B.A. in English and Theater Studies from Yale. Elevator Repair Service, a theater ensemble, was founded by director John Collins and a group of actors in 1991. Since that time, ERS has built a body of highly acclaimed work and has appeared on stages in downtown New York and across the U.S. and Europe. ERS shows are built around a broad range of subject matter including literary, dramatic and cinematic forms. They combine elements of hi-tech and lo-tech design, vaudeville, both literary and found text, found objects and discarded furniture and the group's own highly developed style of choreography. The company has generated a repertoire that includes 14 original full-length pieces and several short pieces and workshop productions. ERS is the recipient of the 2009 Foundation for Contemporary Arts Theater Grant, TCG's 2009 Peter Zeisler Memorial Awars for Outstanding Achievement. The Sound and the Fury (April Seventh, 1928) was nominated for the 2009 Lucille Awards for Outstanding Play and Outstanding Sound Design. During its run at the Sydney Opera House, Gatz was nominated for Australia's prestigious Helpmann Award for Best Play. the Pulitzer Prize, and numerous local Elliot Norton and I.R.N.E. Awards. It was recently named one of the top three theaters in the country by Time magazine. Founded by Robert Brustein in 1980, over its twenty-nine-year history the A.R.T. has welcomed major American and international theater artists whose singular visions generate and define the theater's work, presenting a varied repertoire that includes new plays, progressive productions of classical texts, and collaborations between artists from many disciplines. The Company has performed throughout the US, and worldwide in twenty-one cities in sixteen countries on four continents. Last fall the organization welcomed its new Artistic Director, Diane Paulus, under whose helm the Company begins its 30th Season. Under the leadership of Diane Paulus, A.R.T. has developed a new initiative, EXPERIENCE THE A.R.T., which seeks to revolutionize the theater experience through a sustained commitment to empowering the audience. This audience-driven vision will completely transform the way the company develops, programs, produces, and contextualizes its work. This speaks directly to the A.R.T. 's core mission Â— "to expand the boundaries of theater." A.R.T. resources will give equal importance to the social aspects of theater and the potential for a full theater experience, including interaction and engagement with its audience before, during, and after the production. The initiative involves producing theater cycles that create a festival atmosphere and allow audiences to experience productions in the context of a larger event. By producing and promoting these cycles as citywide events, A.R.T. will seek to attract larger audiences from the greater Boston area and from the rest of the country and world. The A.R.T., located at the Loeb Drama Center at 64 Brattle Street, and at its second space, the theater-club OBERON, at 2 Arrow Street, (corner of Arrow Street and Massachusetts Avenue), Harvard Square, Cambridge, is accessible to persons with special needs and to those requiring wheelchair seating or first-floor restrooms. Deaf and hard-of-hearing patrons can also reach the Theater by calling the toll-free N.E. Telephone Relay Center at 1-800-439-2370. Public transportation and discount parking are available nearby. Complete showings of Gatz begin at 3pm. On full-show days Part 2 will begin at 7:30pm, following an hour-long dinner break. Pre-purchased meals available for an additional $15 at the A.R.T. Box office. Special dinner options also available from restaurant partner Upstairs on the Square.